Although the hacks on this site have mostly focused on software, they do occasionally have a real world component. For example, I've always had a fascination with panoramic photos. Unfortunately, while it's been getting easier and easier to make your own, getting them printed is still a hassle. Ofoto allows you to order 20 x 30 prints for $23 a pop, but even that is not big enough when you consider the elongated aspect ratio of most panoramas. However, if one is a bit more creative with the framing, large scale prints can still be achieved. For example, IKEA sells some square, 20 x 20 frames that would be a perfect fit for the above Ofoto prints. The color does not interest us since we only wish to take advantage of the entire surface area; what does matter is that the frames come with a glass plate that can be used to sandwich the photo and some nearly-invisible clips to hold everything together. The fact that they are $10 each doesn't hurt either. In my particular case, I wanted to use a panorama I had made at Niagara falls. The original was made up of five 6 megapixel photos taken with my Digital Rebel and stitched together with Canon's surprisingly decent bundled software. 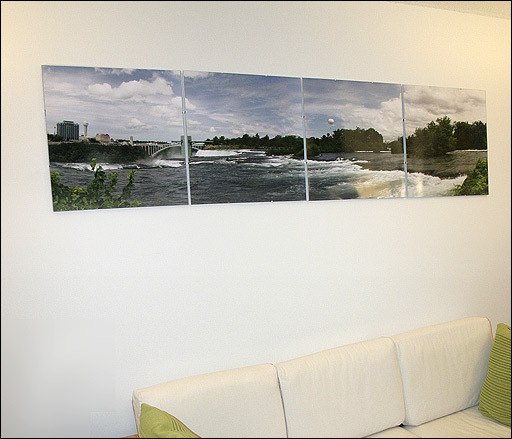 The panorama was split into four square sections, padding was added to let each piece have a 2 x 3 aspect ratio and then the prints were ordered (Ofoto currently has a 25% discount promotion, thus making the high cost easier to swallow). When doing such large prints, having a high resolution file matters - in this case I started with a 7000 x 1750 image. Another image aspect relevant at this size is the noise level, so shooting with a digital SLR (or another camera with a large sensor) on a low ISO setting like 100 is key. Cutting up the prints and attaching them is not rocket science, but I did notice that the measurements that IKEA gives for the frames (50 x 50 cm or 19 ¾ " x 19 ¾ ") are not absolutely precise, and so my prints ended up being slightly smaller than the frame area. Being a bit more generous (e.g. using the full 20 inch height of the print) may be a good idea. The end result is much more satisfying than pre-made prints I have ordered, both from a scale perspective as well as a personalization one. 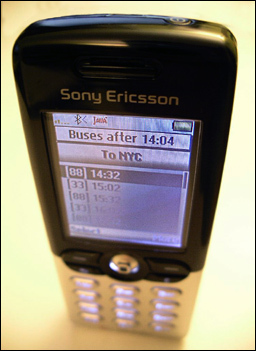 There's been some hoopla about Verizon crippling the Bluetooth implementation on the Motorola v710 phone. Having recently switched from my T610, I've been struggling with transferring all of my old contacts and pictures (crippled Bluetooth or not, T-Mobile's bad reception was unbearable). Contacts can be retyped, but pictures are harder to reconstruct. Having signed up for vtext.com, I also had a vzwpix.com account. That account provides a way to upload files and then send (presumably) an MMS message with the pictures of your choice to any Verizon subscriber. However, sending pictures to myself didn't seem to work: the phone would receive the message notification, but it was never able to download the message itself. I then tried sending pictures as attachments via Mail.app, using 10digitphonenumber@vzwpics.com as the destination. This time the message was fully received, but it claimed that attachments had been stripped, due to AppleDouble being an unknown encoding scheme. Finally, it dawned on me to check the "Send Windows Friendly Attachments" checkbox when adding an attachment (this doesn't seem to be an option when using drag and drop to attach a picture, which is what I tried the first time around). As a final note, the optimal wallpaper size is 176 x 220 (a bit smaller that the screen size since the status bar at the bottom is always present). The way to iterate over the items in an associate array is to use the for (value in array) construct, allowing you to access each item's value via array[value]. It appears that the order in which properties (i.e. items) are traversed is implementation dependent. The ECMAScript specification is pretty vague on the matter, saying (in section 12.6.4) "Get name of the next property of [the object] that doesn't have the DontEnum attribute. If there is no such property, go to [the end]". Firefox, Safari and MSIE appear to traverse items in the order in which they were inserted, while KHTML (within KDE 3.1) and Opera (at least through 7.54) use a seemingly random order that presumably reflects their respective hashtable implementations. If the list of numbers appears in ascending order, then the browser preserves the insertion order. If you are in fact looking to traverse the object's properties in the order they were inserted in, regardless of browser implementation, you'll have to create a (possibly double) linked list that you can use to jump from object to object. Disclaimer: This is the result of my idle thoughts on a Sunday night, and thus is not scientific in any way. No actual research was done. This person is subscribed to your RSS/Atom feed, and is aware of every single entry you publish (reading it is a different matter). If you provide a full-content feed and they choose to read it in their aggregator, then there isn't much that needs to be done, beyond making sure that your feed does in fact accurately reflect your site (e.g. for a while I had forgotten to include all of my MTMacro definitions in my feed template). If they end up reading the entry in their browser, it is best to minimize the extraneous clutter that surrounds the entry text. This can be as simple as making sure that each entry has its own page, but it may also involve removing any sidebars, headers or footers that aren't really relevant to that entry. Since the magic that is RSS/Atom hasn't reached all corners of the earth, some loyal readers may still resort to visiting your site periodically, to see what new things you have posted. Or perhaps you don't provide a feed so readers have no choice but to check the old-fashioned way, via bookmarks. Such readers still visit often and thus are familiar with your site's organization; therefore the previous clutter minimization strategy still applies. However, it is also important to make it easy to see which entries are new. Basic things like making sure you have a different color for visited links matter. The traditional reverse-chronological sorting can be somewhat annoying, but assuming that that the last entry that the reader remembers hasn't fallen off the front page, it should be a matter of scrolling down to it and then reading one's way back up. If in fact there have been so many updates since the last visit that all front page entries are new, then more aid is required. The calendar is of some benefit, although it does require the user to remember the approximate date of their last visit. Providing a way to navigate from entry to entry also helps. Perhaps the best solution is to convince such readers to subscribe to your feed, to make both your lives easier. Depending on which pundit you listen to, linking is the essence of blogs. When a visitor first comes across your site as a result of a cross-site link, they are placed in a pretty unfamiliar environment (depending on how much you deviate from standard templates). The link that induced them visit your site may have provided some context, but that may still not be enough. A sidebar that points to the "surroundings" of this entry (posts in the same category or close chronologically) may help a reader who does not have the background knowledge of a frequent one. Someone coming across one of your entries as the result of a search may be considered a subset of the previous reader type. The key difference is that they have nearly zero context, beyond (possibly) the snippet that was in the search result listing. Having individual entry pages is key (assuming the search engine is clever enough to favor those over time or category archives). There are ways to make the searcher's life easier, but in my experience they are of limited usefulness. Search engines themselves strive to solve this problem as well (e.g. Google's cache with keyword highlighting), and in the meantime "surroundings" suggestions apply. Perhaps this is the procrastinator in me speaking, but I periodically come across a blog that seems interesting and focused enough that I want to read it from beginning to end (or end to beginning if I'm feeling adventurous and/or want more timely information first). Facilitating this is as simple as providing previous/next links on the individual entry pages, but it's surprising how some default templates don't support this behavior. The calendar can be used a substitute, but it requires that a new target (the day following this one) be reacquired upon every click, and thus is suboptimal. This entry goes in tandem with a slight redesign that aims to provide more context, especially for individual entry pages. I had previously used a near-default Movable Type template, which limited itself to previous/home/next links. In the new version, this is replaced by a Jeremy-like sidebar that gives a bit more information. I'm obviously not the first to think about such things, and I don't claim my solution as being optimal, but I now have something that can be iterated upon. To get slightly better performance from a VNC server running on a Mac OS X machine, run ShadowKiller. No shadows means fewer updated pixels, and the ones that do change are more easily compressed. Presumably running some kind of theme that has less translucency than Aqua would help even more. Even if Mail.app is set to remove messages from a POP server "right away" there's some circumstances in which they will be left there indefinitely. Specifically, if you have a rule that auto-deletes certain messages (say, to remove high-scoring spam messages) then Mail.app fetches them from the server, checks them against the rule set, discards them, but forgets to also remove them from the server. Until this bug is fixed, my workaround has been to modify the rule so that it just moves those messages to the Trash and marks them as read. This does mean that I have to remember to empty the trash periodically but 1) I do that already anyway and 2) it's better than ending up with 40,000+ messages on the server and having my webmail client and other not so robust programs die. I don't know what prolific authors of favelets/bookmarklets do when they code them, but I find the process rather annoying. Having to strip out all newlines, and preferably all extraneous whitespace (for the sake of shorter URLs) gets tedious when revising a script that's more than a few lines long. The contents of your .js file should obviously serve as the standard input of the script, and for maximum efficiency (on Mac OS X) its output should be piped to pbcopy so that it can be pasted into a browser's location bar for easy testing. The length of the favelet is also printed, since some browsers impose a maximum URL length. Not quite a favelet IDE, but it certainly makes life easier. After a day in the city, I am heading back to the Port Authority terminal. A decision must then be made: should I hurry to the gate on the chance that there's a bus waiting there, or should I take my time, stop off at the Au Bon Pain, restroom, etc. The bus does in fact have a schedule, but it is a hassle to remember to bring it, pull it out at the appropriate time, and locate the next departing bus in a page full of numbers. The annoyance is doubled by the fact that there two bus lines which I could possibly take, thus there is a need to check two schedules, carry two pieces of paper, etc. In theory the solution would be simple: an electronic display at the entrance to the terminal, showing the next departing bus from each gate. Perhaps even a NextBus-powered one, but that would be asking too much. In the absence of such a convenience, I am forced to take matters into my own hands. The one item that I am much less likely to forget to take with me is my cellphone, thus a solution involving it seems reasonable. The schedule is in fact available on-line, so an approach similar to the one I chose for my cellphone-based dictionary is a possibility. However, the latency of sending out a SMS message and waiting for a response is too great for a time-critical situation such as this one. A non-networked, local, approach is therefore preferable. My T610 is Java-enabled, supporting MIDP 1.0, so writing a simple Java app seems reasonable. Searching turned up this article, showing how to do MIDP development on Mac OS X. Compiling the "Hello World" example worked fine, modulo the need to not have any spaces in the path to the MIDP installation. As the article mentions, deployment can be done via Bluetooth, and indeed transferring the JAR file resulted in the application showing up in the "Games & More" category. Transferring the JAD didn't seem to work however (the phone didn't know what to do with it), so I had to give up the use of resources/properties that the original "Hello World" app made use of. Considering that this is a one-off application, it's not that big of a deal. All that was left was to actually write the application, which I cobbled together from this article that explains the basic GUI concepts, while the MIDP 1.0 spec filled in the details. The only gotcha encountered was that, when running on the emulator, the Calendar instance returned by Calendar.getInstance() was set to GMT time. However, when running on the phone it did use the local timezone, so only testing was made a bit more difficult. There was also the minor annoyance that the Mac/phone Bluetooth pairing would be lost after every transfer, but I'm not sure where the blame for that lies. The BusTimes.jar is ready for deployment on a phone, while the complete source package is available as well (the picture shows roughly what to expect when running it). There is support for Saturday/Sunday schedules, but holiday computation wasn't added. In the event of a schedule change, things may get a bit tedious, but that doesn't happen too often. Now, if only the J2ME implementation in my T610 supported access to Bluetooth and IR. But I guess that's always an excuse to upgrade. What seems to happen when you take too long on your pet project is that someone else gets to it ahead of you. Though perhaps, in this particular case, there's room for improvement. As I was pondering the implications of the Safari RSS announcement (my thoughts pretty much mirror Brent's) I realized that a web browser/feed aggregator combo does have one thing going for it. Subscription to a site right now requires at best a drag-and-drop of the site's URL into NetNewsWire, and at worst looking through the page (or its source) for the (possibly orange) RSS/XML/Atom icon. The blue logo that Safari RSS adds to the location bar makes it much more obvious when a site has a feed, and this is some functionality that NNW doesn't have. It could perhaps be added to current versions of Safari with an InputManager extention á la PithHelmet or Saft. Clicking on it would subscribe to the site's feed using NetNewsWire, or whatever aggregator was registered as a handler for the feed:// protocol. However, this requires a level of Cocoa-based hacking that I'm not familiar with and aren't prepared to learn just yet. The Subscriber favelet then simply invokes it with the current page's URL. If a feed is found, the redirect within the CGI script triggers the feed:// protocol handler thus invoking the aggregator. Such a favelet has the advantage of being easily updatable; if the auto-discovery standard were to change or if Mark figures out even more clever ways of determining if a site has a feed, then all its uses would immediately benefit. Recent revelations have made it very easy to determine the checksum necessary to request a URL's PageRank from Google. Some people, for commercial, egoistical or other reasons, are interested in knowing when the PR of certain URLs changes. As a result, I've whipped up pagerank2rss.pl, a simple Perl script that outputs (in the RSS format) the PR of a list of URLs. Simply drop it in your web server's cgi-bin directory and point your aggregator at it. To change the URLs that it monitors, open it up in a text editor, and modify the %pageRankURLs hash with the URL and its checksum, as computed with the help of this site. It is argued that Google's PageRank is dead. Though that debate is still unsettled (and will continue to be so, unless Google states outright that they are discontinuing it), one PageRank-related thing is in fact dead. Until recently, the only way to get a site's PageRank was to use the Google Toolbar, which relied on a private "channel" to find out the information from Google's servers. This appears to consist of a private URL to which one can pass as arguments, a URL and its checksum, and in return receive that page's rank. Lately, this (obfuscated) barrier has been dented, with the advent of Prog (née Proogle) and the attempted auction of the (reverse-engineered) algorithm on eBay. This culminated today in the public domain distribution of an implementaion. What Google will do about this (if anything - Prog has been up and running for a while, and the eBay auction was not stopped, though thankfully no one was clueless enough to bid either) remains to be seen. Regardless, in the meantime there are a few interesting things than can be done with this bit of information. The first that came to my mind was a simple script that monitors the PR of URLs and reports the results as an RSS feed. Hooked up to an aggregator, it's now possible to see when an URL's rank changes. Presumably this is old news to SEO-types that already have similar tools for doing this, but it may be useful to those that need their egos stroked on a regular basis. The net result is pagerank2rss.pl, a Perl script that can be dropped in a web server's cgi-bin directory. It relies on curl, since that's available by default on Mac OS X, but with a few tweaks it could be made to use wget or LWP. The list of URLs to monitor is stored in the %pageRankURLs hash, along with their computed checksums (using this handy web interface). It is obvious that this is a 20-minute quick and dirty script - I could've computed the checksums myself and the list of URLs could be made accessible via a friendlier web interface. However, given the limbo-ish status of the methods that it uses, I figured it would not have been worth it to spend more time on something that might go away soon. It seems I'm not the only one doing visualizations of my spam flow in an attempt to figure out a solution (my various attempts). I have also found a few essays on challenge/response systems, which seem to contain enough guidelines and real world experience to know what to avoid. Finally, as the image shows, it appears that, as a respected scholar, you haven't really achieved the acclamation you deserve until your name is used to dilute the spam quotient (and baffle the readers) of junk mail. I am investigating a new product for Mscape, since working on the same thing for six years can get somewhat boring. This would involve exposing Mail.app's mailboxes and messages with an alternative GUI, thus I needed to figure out the best way to get data out of it. The most direct way would be as a plug-in (a.k.a bundles). However, this seems to be an undocumented (and unsupported) approach that relies on private Mail.app methods. There are several plug-ins that exist in spite of this, and presumably their developers have a vested interest in keeping the reverse-engineered headers up to date, but there is no absolute guarantee that this approach will always work. Furthermore, there appear to be some complications with this approach, licensing-wise. Most of the plug-ins are open source, specifically under the GPL. I'm guessing that this prevents me from grabbing their headers and incorporating them into my (closed-source) product. httpMail appears to be under a BSD license and may thus be more permissive about such things, but it's still a messy thing that I'd rather not deal with. The spread is much tighter, and so any method should be satisfactory. However, the pre-compiled, Mac::OSA::Simple, approach is still preferable, since in addition to its slight performance advantage, it also provides some handy methods, like the ability to invoke specific handlers within a script. The only approach that may provide better performance and more flexibility would be to use AppleEvents directly, via Mac::AppleEvents::Simple, but this would be much more tedious, since I would have to build them (the events) by hand. Grabriel Radic made the observation that it is indeed possible to make Mail.app differentiate between messages based on SpamAssassin score (in reference to my previous entry bemoaning the need for better filtering). Specifically, SA adds a X-Spam-Level header, whose contents are the message's score represented as asterisks (one point = one asterisk). By creating a rule that filters on this header (the "Edit Header List..." command allows filtering based on custom headers), it is possible to do things per score (e.g. color messages differently, or even delete the outright). The latter possibility interests me the most at this time, since anything that reduces the number of messages I have to deal with helps (though this would still be a stop-gap solution until I have time to implement my challege-response solution). The question then becomes, what should this threshold be set to? I hacked up a Perl script that uses Email::Folder to parse my Junk mbox and generate (via Excel) a histogram of spam scores. The figure shows the results, with the quartiles (roughly) being highlighted. For starters, I have decided to set the threshold at 11, which (given this week's distribution) would remove about half the messages outright. This would still leave me with about 8,000 messages per week, so I may have to be even more stringent. A couple of months ago I posted an entry describing my spam filtering status. At that point, I was very happy to see that my weekly level had declined from ~4,000 to ~2,000 messages. 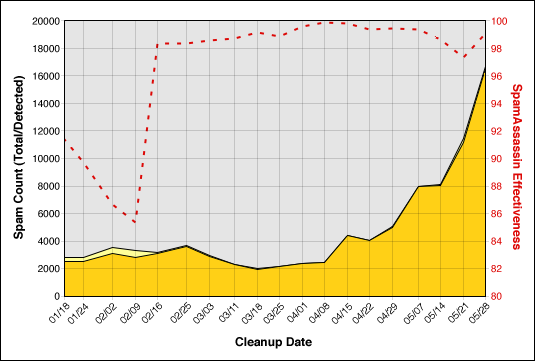 That decrease coincided with a net-wide downturn in spam levels, and was additionally boosted by some tweaks I had done to my rules. I'm sorry to say that the respite was purely temporary; as the chart shows I'm now getting ~16,000 messages a week. Things have gotten to the point where filtering attempts are breaking down. For example, a recent spammer tactic is to stuff messages with random words in attempt to dilute the overall "spammy-ness." Although, as described by Paul Graham in his FAQ, this won't get around Bayesian filters, it does have another side effect. With enough of these messages being received (i.e. in my situation) then these filler words also begin to acquire a positive correlation with spam messages. 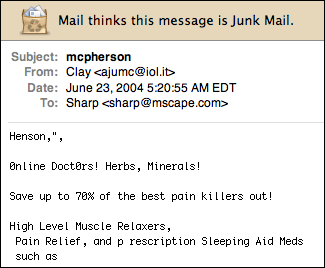 With my corpus thus "poisoned," even completely innocent messages will be marked as spam. 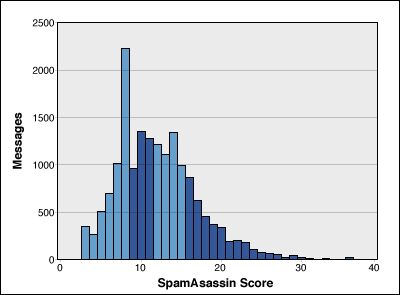 The net result of this is that I've been forced to lower the weight of the Bayesian rule within SpamAssassin so that by itself it is not enough to bring a message's score over the spam threshold. I am now forced to depend more heavily on the other rules (that look for broken headers, certain words, etc.) that SpamAssassin provides. However, since these rules are universal (and publicly available), spammers can (and have begun to) tune their messages against them to make sure that none are triggered. This explains the decrease in effectiveness in the latter half of May. I have also noticed other tricks, notably a couple involving the "Subject" header. I have set SA to prepend "**JUNK**" to the subject of any message over the threshold, and then by sorting by subject Mail.app's Junk folder (I'm using its built-in filtering in combination with SA), I can see what was marked by SA. One way to work around SA's marking is to not have any subject header at all, in which case it appears to do no prepending at all. Another way is to have two headers, in which case SA modifies only one of them. It just so happens that Mail prefers the opposite one from SA. The net result in both cases is that these messages are not sorted with all of the spam, and thus I'm forced to check them by hand (since Mail.app is less forgiving than SA, those that SA doesn't mark as junk have to be checked by hand for false-positives). 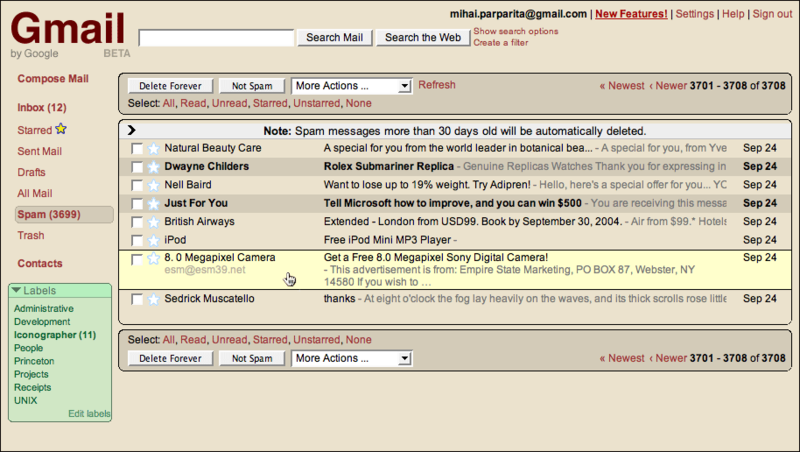 Ideally, this would involve shutting down mscape.com's email access entirely, and moving to another domain (e.g. this one). However, that's not feasible due to the number of copies of Iconographer that are floating around and contain email addresses at mscape.com (in addition to other places and people that may have address there). The next best thing is to switch to a challenge-response system, a la Mailblocks. It would probably have to be a home-grown solution, since there are a few tweaks that I'd want to make in order to make the transition as painless as possible. First of all, I'd want the entire thing to reside on my servers, since solutions that involve forwarding or redirection would mean an increase in traffic and generally seem rather brittle. I would also have to do extensive whitelisting, supporting not only addresses (ideally I'd upload my "Sent" mbox and extract people's emails from there) but also keywords (e.g. all emails containing "Iconographer" and such words). I don't know if there are any open source solutions that I could build on, but if not, it should make a fun summer project. Want to look up words on the go? Send an email (from your cellphone, smartphone, Blackberry, pager, etc.) to with your word in either the subject or the body, and in return receive the word's definition. 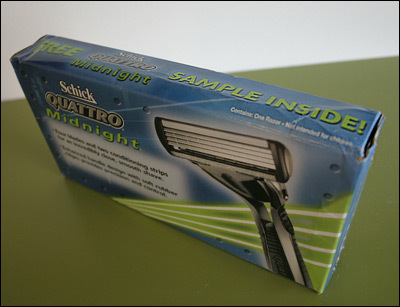 Low-tech (no SOAP, XML-RPC, WAP, WS, etc. here), and yet handy and It Just Works™. Want to run the script yourself? See dictionary.pl. I have wanted to look up words in locations where a dictionary is inaccessible often enough that I have decided to do something about it. My cellphone is usually within reach, and in theory always has signal (in practice, I may need to switch from T-Mobile to Verizon in order to make that assertion hold). Modern phones may have a WAP or even a web browser built-in (especially those of the smartphone variety), but that's not something I can rely on (neither do I relish having to do anything with WAP). However, almost all phones sold within the past two years (mine included) have some kind of SMS functionality, and usually by extension some form of email access (via an SMS or MMS gateway, if not an outright email client). The ideal solution is therefore to have a service listen to some email address, and upon receiving a message, have it return the definition(s) of the word(s) contained. This would be simple enough to implement and at the same time accessible by the most devices (Blackberry handhelds and two-way pagers included). Leaving aside the "listening to an email address" part for the moment, we need to parse a received email, look up words, and send a message in return. Much in the same way that we approached the NNTP to RSS bridge, we will leverage existing Perl modules and only write some glue between them. Specifically, Mail::Internet and Mail::Header allow us to do the message parsing, while Net::Dict allows us to interface with RFC 2229-compliant dictionary servers. Specifically, we will use dict.org, which has access to eleven dictionaries, but any other server would work just as well. Since we're trying to minimize message size (SMS gateways have ~140 character limits), we only pick one definition to return (dictionaries are ranked in order of preference), and do some clean-up to strip out unnecessary whitespace. dictionary.pl is a Perl script that does all this plus some other clean-up (e.g. signature removal) and sanity checks. Now we need to make it so that this script is invoked when a message at a specific address is received (with the contents of said email piped to it). This server happens to be running qmail, and so we can use a .qmail file for this. Specifically, I created the file .qmail-persistent:info-dictionary and within it I had the line |/fullpath/dictionary.pl (this discards the message after processing, but it is possible to add a second line with a mailbox path so that it would be received normally as well). 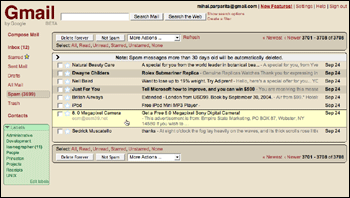 Other email systems (sendmail, etc.) presumably have similar mechanisms, but I have not checked. The net result is that I can now send email to and receive word definitions from wherever I am. An obvious extension would be to support SMS directly (thus broadening accessibility even more), but I'm not sure how exactly I'd approach that (there are free gateways for sending SMS, but receiving is seemingly trickier - I'd have to get a cellular modem presumably). Apologies for having the email address as an image, but since I have gotten to the point of receiving 10,000+ spam email a week, I am forced to recourse to such extreme measures (the previously-observed decrease was very short-lived).